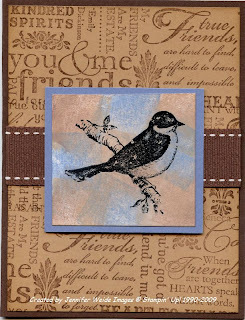 Another spot background card, this one using the Friends 24-7 set. Card base is Chocolate Chip. Background layer is Creamy Caramel wheeled with the Friendly Words jumbo wheel in Chocolate Chip. 1" Chocolate Chip grosgrain around the center. The spot background was done, again using Glossy Cardstock, with Ballet Blue, Chocolate Chip & Creamy Caramel spots. Bird stamped with Black Stazon and layered onto Ballet Blue. Cool card! LOVE the combination of colors! I wish I could get my wheels to look THAT good together! Makes it look like a background stamp instead of a wheel!